Understanding atmospheric thermodynamics begins with the gas laws that you learned in chemistry. Because these laws are so important, we will review them again here and put them in forms that are particularly useful for atmospheric science. You will want to memorize these laws because they will be used again and again in many other areas of atmospheric science, including cloud physics, atmospheric structure, dynamics, radiation, boundary layer, and even forecasting. 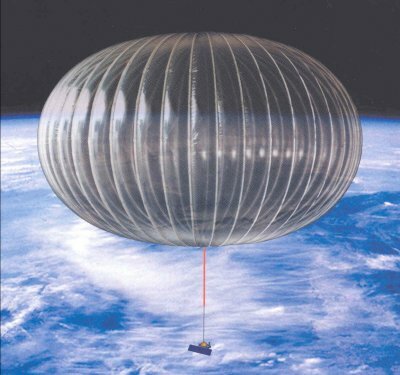 A constant pressure balloon stays aloft for weeks at an altitude of 100,000 ft so that the instruments in the attached gondola can make long-term measurements. This week's topic is a hypothetical question involving stability. The troposphere always has a capping temperature inversion—it's called the stratosphere. The tropopause is about 16 km high in the tropics and lowers to about 10 km at high latitudes. The stratosphere exists because solar ultraviolet light makes ozone and then a few percent of the solar radiation is absorbed by stratospheric ozone, heating the air and causing the inversion. Suppose that there was no ozone layer and hence no stratosphere caused by solar UV heating of ozone. Would storms in the troposphere be different if there was no stratosphere to act like a capping inversion? And if so, how? You will use what you have learned in this lesson about the atmosphere's pressure structure and stability to help you to think about this problem and to formulate your answer and discussions. So, think about this question as you read through the lesson. You'll have a chance to submit your response in 2.6! where p is pressure (Pa = kg m–1 s–2), V is the volume (m3), N is the number of moles, R* is the gas constant (8.314 J K–1 mole–1), and T is the temperature (K). Note also that both sides of the Ideal Gas Law equation have the dimension of energy (J = kg m2 s–2). Recall that a mole is 6.02 x 1023 molecules (Avagodro’s Number). Equation 2.1 is a form of the ideal gas law that is independent of the type of molecule or mixture of molecules. A mole is a mole no matter its type. The video below (6:17) provides a brief review of the Ideal Gas Law. Note that the notation in the video differs slightly from our notation by using n for N, P for p, and R for R*. ρ= NM V This equation is not rendering properly due to an incompatible browser. See Technical Requirements in the Orientation for a list of compatible browsers. where M is the molar mass (kg mol–1). Density has SI units of kg m–3. The Greek symbol ρ (rho) is used for density and should not be confused with the symbol for pressure, p.
p= ρ R * T M or ρ= Mp R * T This equation is not rendering properly due to an incompatible browser. See Technical Requirements in the Orientation for a list of compatible browsers. M average = ∑ i N i M i ∑ i N i = ∑ i N i M i N = ∑ i N i N M i = ∑ i f i M i This equation is not rendering properly due to an incompatible browser. See Technical Requirements in the Orientation for a list of compatible browsers. where the i subscript represents atmospheric components, N is the number of moles, and M is the molar mass. This video (3:19) shows you how to find the gas density using the Ideal Gas Law. You will note that the person uses pressure in kPa and molar mass in g/mol. Since kPa = 1000 Pa and g = 1/1000 kg, the two factors of 1000 cancel when he multiplies them together and he can get away with using these units. I recommend always converting to SI units to avoid confusion. Also, note that the symbol for density used in the video is d, which is different from what we have used (ρ, the convention in atmospheric science). R* = 8.314 J K–1 mol–1. Here, p = 960 hPa = 9.6 x 104 Pa and T = 20 oC = 293 K.
Putting these values into the equation 2.3, we get that the dry air density is 1.1 kg m–3. What would the density be if the room were filled with helium and not dry air at the same pressure and temperature? Often in meteorology we use mass-specific gas laws so that we must specify the gas that we are talking about, usually only dry air (N2 + O2 + Ar + CO2 +…) or water vapor (gaseous H2O). We can divide R* by Mi to get a mass-specific gas constant, such as Rd = R*/Mdry air. p d = ρ d R d T This equation is not rendering properly due to an incompatible browser. See Technical Requirements in the Orientation for a list of compatible browsers. Rd = R*/Mdry air = 8.314 J K–1 mol–1 / 0.02897 kg mol–1 = 287 m2 s–2 K–1 = 287 J kg–1 K–1. Mdry air is 0.02897 kg mol–1, which is the average of the molar masses of the gases in a dry atmosphere computed to four significant figures. Note that p must be in Pascals (Pa), which is 1/100th of a mb (a.k.a, hPa), and T must be in Kelvin (K). p v ≡e= ρ v R v T This equation is not rendering properly due to an incompatible browser. See Technical Requirements in the Orientation for a list of compatible browsers. where Rv = R*/Mwater vapor = 8.314 J K–1 mol–1 / 0.01802 kg mol–1 = 461 m2 s–2 K–1 = 461 J kg–1 K–1. Typically e is used to denote the water vapor pressure, which is also called the water vapor partial pressure. p= p d + p H2O = p d +e This equation is not rendering properly due to an incompatible browser. See Technical Requirements in the Orientation for a list of compatible browsers. Imagine that we put moist air and an absorbent in a jar and screw the lid on the jar. If we keep the temperature constant as the absorbent pulls water vapor out of the air, the pressure inside the jar will drop to pd. Always keep in mind that when we measure pressure in the atmosphere, we are measuring the total pressure, which includes the partial pressures of dry air and water vapor. ρ= ρ d + ρ v This equation is not rendering properly due to an incompatible browser. See Technical Requirements in the Orientation for a list of compatible browsers. Suppose we have two air parcels that are the same size and have the same pressure and temperature, but one is dry and the other is moist air. Which one is less dense? We can solve this one without knowing the pressure, temperature, or volume. Let’s assume that 98% of the molecules are dry air, which means the remaining 2% are dry air in the first case and water vapor in second case. Dry air is 0.029 kg mol–1 and water vapor is 0.018 kg mol–1, so 2% of the moist air is lighter than the 2% of dry air, and when we consider the total air, this means that for the same temperature and pressure, moist air is always less dense than dry air. Suppose there are two air parcels with different temperatures and water vapor amounts but the same pressure. Which one has a lower density? We can calculate the density to determine which one is lighter, but there is another way to do this comparison. Virtual temperature, Tv, is defined as the temperature dry air must have so that its density equals that of ambient moist air. Thus, virtual temperature is a property of the ambient moist air. Because the air density depends on the amount of moisture (for the same pressure and temperature), we have a hard time determining if the air parcel is more or less dense relative to its surroundings, which may have a different temperature and amount of water vapor. It is useful to pretend that the moist parcel is a dry parcel and to account for the difference in density by determining the temperature that the dry parcel would need to have in order to have the same density as the moist air parcel. q= ρ v ρ d + ρ v This equation is not rendering properly due to an incompatible browser. See Technical Requirements in the Orientation for a list of compatible browsers. We see that q is just the fraction of water vapor density relative to the total moist air density. Usually q is given in units of g of water vapor per kg of dry air, or g kg–1. T v =T[ 1+0.61 q ] This equation is not rendering properly due to an incompatible browser. See Technical Requirements in the Orientation for a list of compatible browsers. where T and Tv have units of Kelvin (not oC and certainly not oF!) and q must be unitless (e.g., kg kg–1). Note that moist air always has a higher virtual temperature than dry air that has the same temperature as the moist air because, as noted above, moist air is always less dense than dry air for the same temperature and pressure. Note also that for dry air, q = 0 and the virtual temperature is the same as the temperature. Consider a blob of air (Tblob = 25 oC, qblob = 10 g kg–1) at the same pressure level as a surrounding environment (Tenv = 26 oC and qenv = 1 g kg–1). If the blob has a lower density than its environment, then it will rise. Does it rise? We will use equation (2.10). Remember to convert T from oC to K and q from g kg–1 to kg kg–1! T vblob =(25+273)[ 1+0.61⋅.010 ]=299.8 K=26.8 C o T venv =(26+273)[ 1+0.61⋅.001 ]=299.2K=26.2 C o This equation is not rendering properly due to an incompatible browser. See Technical Requirements in the Orientation for a list of compatible browsers. We see that the blob is less dense than its environment and so will rise. This difference of 0.6 oC may seem small, but it makes a huge difference in upward motion. T vblob =(25)[ 1+0.61⋅.010 ]=25.15 C o T venv =(26)[ 1+0.61⋅.001 ]=26.02 C o This equation is not rendering properly due to an incompatible browser. See Technical Requirements in the Orientation for a list of compatible browsers. We calculate that Tvblob < Tvenv, which is the wrong answer. T vblob =(25+273)[ 1+0.61⋅10 ]=2115K=1842 C o T venv =(26+273)[ 1+0.61⋅1 ]=481K=208 C o This equation is not rendering properly due to an incompatible browser. See Technical Requirements in the Orientation for a list of compatible browsers. We calculate that Tvblob > Tvenv, which is correct in this case, but the numbers are crazy! After you complete your calculations, if the numbers you get just don’t seem right—like these—then you know that you have made a mistake in the calculation. Go looking for the mistake. Don’t submit an answer that makes no sense. ρ d = p d R d T v This equation is not rendering properly due to an incompatible browser. See Technical Requirements in the Orientation for a list of compatible browsers. Quiz 2-1: What will that air parcel do? This quiz will give you practice calculating the virtual temperature and density using the Excel workbook that you set up in the last lesson. Go to Canvas and find Practice Quiz 2-1. You may complete this practice quiz as many times as you want. It is not graded, but it allows you to check your level of preparedness before taking the graded quiz. I strongly suggest that you enter the equations for density and for virtual temperature in your Excel worksheet and use them to do all your calculations of density and virtual temperature on both the practice quiz and the quiz. When you feel you are ready, take Quiz 2-1. You will be allowed to take this quiz only once. This quiz is timed, so after you start, you will have a limited amount of time to complete it and submit it. Good luck!